> > (especially since the "premium"
> to stay the same on the timescale you are talking about (5-8 years). That's a fair criticism, but look at it this way. Apple and Samsung produce at least half the smartphones and tablets shipping worldwide. Apple does its own designs, even doing its own cores now, narrowly targeted to the products it sells. It is unlikely to be satisfied with purchasing over the counter parts from Intel that are designed to satisfy the needs of a wide range of customers, which would be available to anyone. If they were, they wouldn't have even done the A4, let alone the A6, and would buy Snapdragon SoCs like everyone else. Samsung isn't doing its own cores, but it designs its own SoCs using standard ARM cores and has its own fabs. It will want the volume of chips going into the smartphones and tablets it sells to be produced in those fabs to help depreciate them and provide funding to keep on the Moore's Law train. Why give Intel that volume and money? The bigger Samsung's market share gets, the less sense buying from Intel makes, even assuming Intel is eventually able to leverage their process advantage into a performance advantage. The window of opportunity for Android devices to sell on performance is probably closing. In the past when "Android lag" was a problem, faster CPUs with more cores may have been seen as the cure. But Google eventually fixed the lag, and the quad core CPUs at nearly 2GHz going into some of these devices is already overkill. Someone upgrading from a laggy older phone today will care about performance, but the people upgrading from an S3 next year? I doubt it will be at the forefront of their needs, because it won't have been a problem on their previous phone. Not saying performance won't matter at all, but it won't hurt Samsung much if HTC sells x86 based phones that can beat Samsung's in benchmarks. Nor would it help Nokia much if they sell x86 based Lumias that can beat iPhones in benchmarks. Ditto for battery life. Beyond a day's use for a smartphone it is nice to have but not a critical factor for very many people (if it was, there would be more phones like the Razr Maxx) The main benefit of better battery life is that it lets you make a thinner, lighter phone. The screen and cellular/GPS/wifi/bluetooth radios take a larger and larger portion of the battery as screens get bigger and we go from 3G to LTE to LTE Advanced and so on, making CPU efficiency less and less important to overall device battery life as time goes on. Doug S (foo.delete@this.bar.bar) on February 1, 2013 4:41 pm wrote: > anon (anon.delete@this.anon.com) on January 31, 2013 4:59 pm wrote: > > > (especially since the "premium" > > > smartphone/tablet market is already occupied by Apple, which has its own cores > > > and chips). > > > > Well that all sounds pretty implausible. Apple only "occupies" premium tablet > > market. Smartphone is much more competitive. And the situation is not likely > > to stay the same on the timescale you are talking about (5-8 years). > > > That's a fair criticism, but look at it this way. Apple and Samsung produce > at least half the smartphones and tablets shipping worldwide. > > Apple does its own designs, even doing its own cores now, narrowly targeted to the products it sells. > It is unlikely to be satisfied with purchasing over the counter parts from Intel that are designed to > satisfy the needs of a wide range of customers, which would be available to anyone. If they were, they > wouldn't have even done the A4, let alone the A6, and would buy Snapdragon SoCs like everyone else. 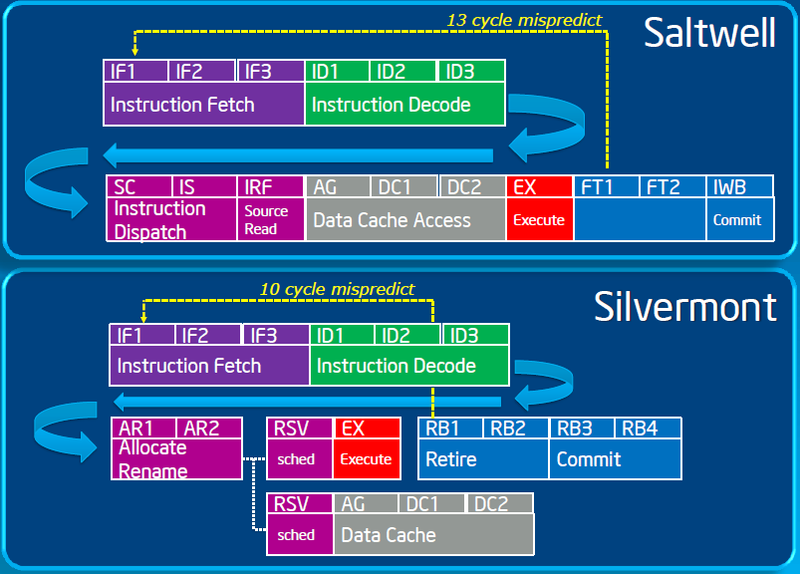 > > Samsung isn't doing its own cores, but it designs its own SoCs using standard ARM cores and has its own fabs. > It will want the volume of chips going into the smartphones and tablets it sells to be produced in those > fabs to help depreciate them and provide funding to keep on the Moore's Law train. Why give Intel that volume > and money? The bigger Samsung's market share gets, the less sense buying from Intel makes, even assuming > Intel is eventually able to leverage their process advantage into a performance advantage. > > The window of opportunity for Android devices to sell on performance is probably closing. In > the past when "Android lag" was a problem, faster CPUs with more cores may have been seen as the > cure. But Google eventually fixed the lag, and the quad core CPUs at nearly 2GHz going into some > of these devices is already overkill. Someone upgrading from a laggy older phone today will care > about performance, but the people upgrading from an S3 next year? I doubt it will be at the forefront > of their needs, because it won't have been a problem on their previous phone. > > Not saying performance won't matter at all, but it won't hurt Samsung much if HTC > sells x86 based phones that can beat Samsung's in benchmarks. Nor would it help > Nokia much if they sell x86 based Lumias that can beat iPhones in benchmarks. > > Ditto for battery life. Beyond a day's use for a smartphone it is nice to have but not a critical factor for > very many people (if it was, there would be more phones like the Razr Maxx) The main benefit of better battery > life is that it lets you make a thinner, lighter phone. The screen and cellular/GPS/wifi/bluetooth radios take > a larger and larger portion of the battery as screens get bigger and we go from 3G to LTE to LTE Advanced and > so on, making CPU efficiency less and less important to overall device battery life as time goes on.